While tying leaders in the boat, a customer noticed that I was making many more loops of line around the shank of the hook while tying egg bumper knots than he normally did and wondered why I did it. I explained to him that these extra loops usually allow your bait to last longer and subsequently gives anglers more actual fishing time while on the water ... certainly something we could all use. Most commercially tied leaders have five or six wraps of line on the uppermost part of the egg bumper knot ... you know, those first five or six wraps you make around the shank before you run the line through the eye of the hook. Most steelhead anglers that tie their own leaders for bait fishing do the same. 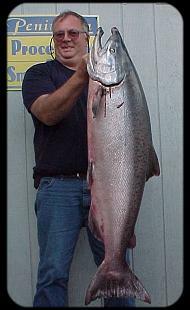 A large glob of eggs held in a bait loop produced this Kenai River King. By chance a few years ago I tried tying some hooks up with about 18-20 initial wraps on the shank (I don't quite remember why I did this in the first place), and I found that the resulting larger bait loop didn't seem to cut through delicate baits like sandshrimp or eggs nearly as easily as the standard egg bumper knot. 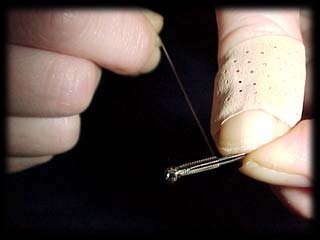 It seems that having more pressure exerted on the bait by the shank of the hook rather than just the loop of line prevented the loop from cutting through the bait as easily. I still make the standard number of loops after running the line through the eye of the hook (five or six) ... I've played with that too, and it doesn't seem to make much difference in knot strength. 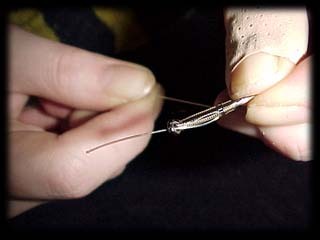 Try tripling the number of loops in your initial wraps and I think you'll find that your baits last longer ... perhaps the companies that produce tied leaders don't tie like this because of some mass conspiracy between tackle manufacturers and retail shops to have anglers use more bait ... nah, I don't think so!